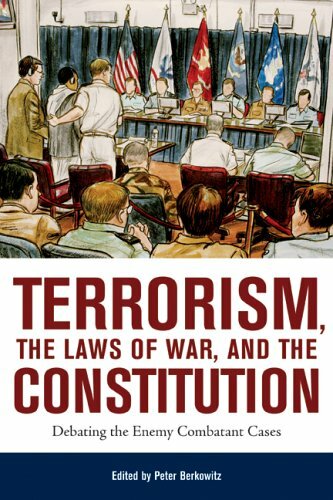 This volume examines three enemy combatant cases that represent the leading edge of U.S. efforts to devise legal rules, consistent with American constitutional principles, for waging the global war on terror. The distinguished contributors analyze the crucial questions these cases raise about the balance between national security and civil liberties in wartime and call for a reexamination of the complex connections between the Constitution and international law. The book undermines the very notion that terrorism is a legitimate method of political struggle and for changing the conditions that lead people to embrace it. The authors examine the diplomatic, educational, and religious aspects of the problem. This paper presents the results from research into the role of the internet in the radicalisation of 15 terrorists and extremists in the UK. Our research supports the suggestion that the internet may enhance opportunities to become radicalised. The authors identify serious weaknesses in the immigration, asylum, and border regimes from Canadian and American perspectives. The entry of a number of potentially dangerous individuals should warrant major attention and policy review. September 11 continues to roil our collective mind. The essays in this book take a sometimes sobering, sometimes uplifting look at a historic turning point in our lives. The contributors examine the challenges and dangers of our new foreign policy.